Prior to my trip to Japan, while I was still planning and trying to figure out where to stay, I decided to try CouchSurfing. If you’re not familiar with the site, it is essentially a community of international travelers who let other travelers stay with them during their trip for free. Sometimes the host will also take the couchsurfer around their hometown or hang out with them as well, but it is not required. I did not have any luck finding a host in Tokyo, but I was lucky in another way for using the site. Because I had my trip plans posted publicly, others were able to browse and see that I would be in Tokyo during these certain dates. Satoshi, one of the leaders of a Facebook and Meetup group called Japanize!, saw that I would be in Tokyo and invited me to their event, which was to take place on the first full day of my stay in Japan. There were two events that day they were hosting, the first of which was exploring the area of Tokyo called Akihabara, and going to a “maid cafe“. Akihabara, sometimes labeled the “electric city” on the train system in Japan, is the gaming, electronics, anime, and “otaku” sector of Tokyo. If you are interested in any of those things, Akihabara will be quite a sight for you. The other event that Japanize! was holding was going to a beer garden, another uniquely Japanese event which I will get into later. Since I knew I would be already going to Akihabara that day already, I decided to head there earlier in the day before the meetup so I could explore on my own and go to some shops. In Japan, most stores don’t open until 10 or 11 in the morning, so if you are visiting, you don’t have to get up too early. When arriving in Akihabara by train, one of the first places you will see is the giant electronics store Yodobashi Camera. The most analogous store in the US to Yodobashi is Best Buy, but there really isn’t any store in the US like this. As referenced by the name, the store specializes in camera equipment, but it sells all kinds of electronics. 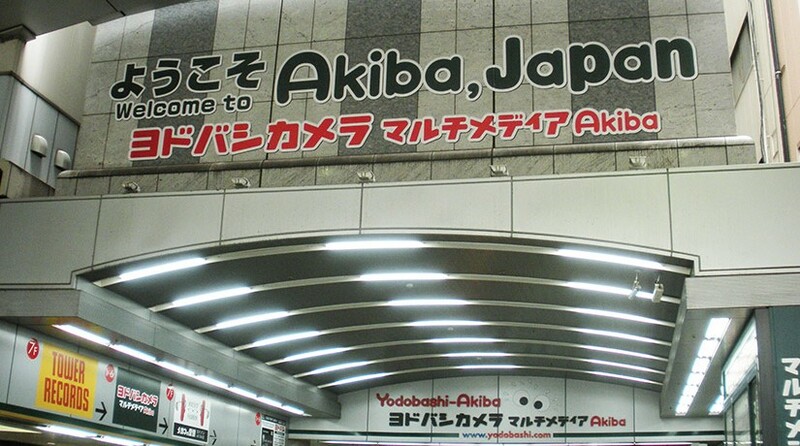 There are Yodobashi Camera locations in several districts of Tokyo, but the Akihabara store is the most famous. The shop is eight stories tall, with different electronics offerings on each floor. PC gaming is not as popular in Japan as it is in America and Europe, but Yodobashi Camera had a better selection of PC games than most Best Buys I have been to in the US. Akihabara is one of the best areas of Tokyo to go just for sightseeing. Both the people there and the buildings are very unique to Japan. There are advertisements for anime and manga on almost every building. Gamers, despite the shop name, is one of the most popular places for anime and manga fans. Prize arcades are also very common across Tokyo and especially in Akihabara. Some of these places also have traditional arcade games like Street Fighter or Tekken, but most of the machines in Club Sega and Taito Game Station are “UFO Catcher” type games. In America, they are basically the claw prize games that often have stuffed animals as prizes. There is a difference in how the game works though, in that at these UFO catcher games, players are trying to knock the prize off a stand, and it will take many turns to accomplish this. So if you put enough money into it, you can definitely win, but you will never get lucky on the first try and win something. Most of the prizes at these two places were anime related goods like posters or figures. It is not uncommon to see people dressed up as characters to promote different ships in Akihabara. I’m not sure what these cat characters are from though. KFC is one of the most popular American fast food restaurants in Japan. Something else you will see all across Akihabara are girls in maid outfits promoting different shops or handing out flyers. You can see a few of them in this photo. After exploring for a while on my own, I finally went to meet up with the Japanize! group shortly after noon. There ended up being about 40 of us heading to the maid cafe. Maid cafes are not something you will find in America or other Western nations, at least in the same form as they are in Japan. The concept of the maid cafe is like a cosplay restaurant, where all of the servers are dressed in maid outfits. Patrons are supposed to be treated as masters rather than customers. At the cafe we visited, no photos were allowed to be taken of the maids, as getting a photo with a maid was part of what you were paying for. This cafe was rather expensive at 1,500 JPY for only having tea, but you are paying more for the experience than the food and drink. We were allowed to stay for 1 hour and at the end, the maids did a song and dance routine on a stage in the middle of the cafe. For a lot of us in our group, the other patrons were more memorable than the maids. Most of us, including myself, would not have visited a maid cafe on our own and were doing it with the group for the experience and novelty of it. But there are people who visit the maid cafes as a form of escape from the real world. The most memorable part of our visit was seeing a Japanese salaryman, who we could tell was a regular customer. Near the end of our visit, when the maids were putting on their song and dance routine, this salaryman got out of his seat and started doing his own dance, equipped with glowsticks in both hands that presumably he brought with him. It was obvious that this was not the first time he had done this dance from how choreographed it was. While it was a little sad to think about how much time this salaryman might spend at this cafe, we were glad we were there to witness it as it was truly hilarious. While going to a maid cafe was one of the most bizarre experiences I have ever had, it was also a lot of fun because of the group I was with. If you are at least familiar with or curious about otaku culture in Japan and are there visiting and have a group to go with, I think it is something worth experiencing. You will definitely get a good story out of it. I’ll have a future post on more things I did and saw on a different trip to Akihabara. Is this a part of Tokyo you would want to visit?